Watch Tommy Lawrence's chance encounter with BBC reporter Jump to media player A BBC reporter unwittingly asks former Liverpool goalkeeper Tommy Lawrence, who has died aged 77, for his memories from the derby game with Everton. Bosses braced for 'special' derby Jump to media player Liverpool boss Brendan Rodgers says Merseyside derbies are wonderful games to be involved in. The feeling when you score, it's amazing Jump to media player Daniel Sturridge says there is no better feeling in the world than scoring a goal, especially in a game such as the Merseyside derby. 'Phenomenal' support buoys Martinez Jump to media player Roberto Martinez says he is excited to see Everton's "phenomenal" travelling support when his side take on Lille in the Europa League on Thursday. 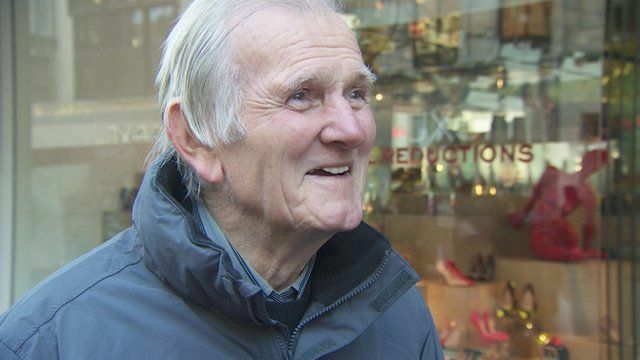 Watch as a BBC reporter unwittingly asks former Liverpool goalkeeper Tommy Lawrence, who has died aged 77, for his memories from the derby game with Everton. In 2015, Stuart Flinders was asking people on the street in Liverpool if they remembered the 1967 match at Goodison Park. He was actually talking to Tommy Lawrence, who played in goal for Liverpool for over a decade, and appeared in that very game.